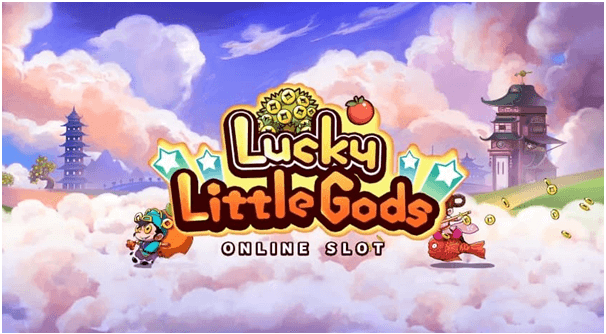 Lucky Little Gods is a Chinese oriental themed online slot machine theme with lots of cute characters who may well have jumped straight from a manga comic and to make you lucky is their aim. Lucky Little Gods is a five reel slot with three rows and two hundred and forty three ways to win; those gods and other characters will combine to offer players free spins and a lucrative treasure pot for the luckiest players. The quirky design and even wackier animations will take you high up where the reels spin against pinkish clouds and Chinese temples with your cell phone or PC the game can be enjoyed for free or for real money. Before you start scooping coins with the two little so called gods, you should set your bets. By clicking on “Coins Stack” you will set bet size which ranges from 0.30 to 30, and bet value which goes up to ten. “Spin” will set the reels in motion, and “Autoplay” option is used to turn the reels without interruption for a chosen number of times. The maximum bet per spin is up to $300 while the minimum is 30 pence. The top cash prize that can be won is a cracking non-progressive jackpot of $30,000 (1,500 coins) plus it contains three bonus modes including a free spins feature that awards up to 10 free spins where 1 to 5 symbols can be transformed into wilds. Base game wins are good too wins of up to 100x your stake have been recorded. Three bonus modes are randomly triggered during the base game making it 4 in total. The first one is the Golden Tree Scatter which is initiated when the Golden Tree scatter pitches on reels 1 or 5-it rewards you with a cash bonus of around 35x to 40x your line bet. If you had a non-winning spin during the main game it’s triggered randomly, a Chinese character pops up and awards you with a wad of cash. The Little God Bonus pays anything from 4x to 40x your wager. During the main game the ‘Treasure Pot Scatter Bonus’ is triggered when the Treasure Pot scatter appears on the 3rd reel. All you need to do here is to pick a pot, the pot you’ve picked will reveal a cash prize of up to 100 times your wager. This is where all the action is at, of all the bonus modes this one is the most lucrative. The free spins feature is initiated when 3, 4 or 5 firecracker scatters pop up on reels 3, 4 or 5. The amount of free spins rewarded are proportionate to the scatters. For 3 scatters you’ll pocket 8 freebie, for 4 you’ll pocket 9 and for 5 you’ll receive a neat 10 free spins. Now, keep your eyes on the 1 and 5 reels because they can become fully wild when a wild symbol pops up. The RTP or average return to player percentage of Lucky Little Gods is 96.2%, it’s of medium volatility and should be played with a bankroll of at least $200 or 300 to give you a sporting change to trigger a bonus feature. With three bonus games during the base and then there’s the free spins feature that pays as much as 440x your stake on a single spin. The biggest wins are reserved for the free spins thanks to those two wilds and all this can make you win 1,500 coins as jackpot.